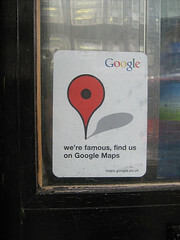 Remember the Google Maps stickers spotted throughout the UK? They looked like the image on the right of this post. Well, a while back, probably a year or so ago, I convinced Google to send me one. It never actually made it to my office. I didn't really think about it until now, when I spotted a Google Groups thread that has word from Google that the stickers are forever gone! Say it ain't so! Can those stickers become collector items? Did I miss out on my opportunity on receiving one of these collectables? Maybe a neat tip for Google would be to start a map game, to find the missing Google Maps stickers. Or maybe not.